A camera aboard NASA's Mars Reconnaissance Orbiter spacecraft returned its first four images to Earth this morning, and astronomers say they were "thrilled" with the results. 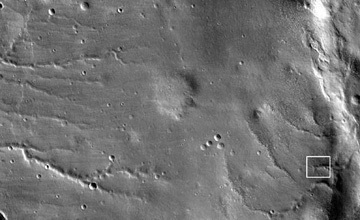 Sharp crater rims and details visible on the surface indicate that the high-resolution camera is stable and working as scientists had hoped. The four test images arrived at the University of Arizona in Tucson today. The spacecraft had locked into orbit around Mars on March 10. Equipped with the latest technology, the images from the orbiter will help astronomers analyze details on the martian surface. Today, scientists on Earth received the first images taken from a camera aboard the Mars Reconnaissance Orbiter. One image (top), along with a close up view of the part of that image in the white box (bottom), show details on the martian surface. Images are courtesy of NASA/JPL/University of Arizona. From an altitude of 2,489 kilometers (1,547 miles) above the planet, the High Resolution Imaging Science Experiment (HiRISE) camera takes images with a resolution of about 2.5 meters (8 feet) per pixel, making a 2.5-meter-long object appear as a dot, according to NASA. That resolution is about equal to that of previous images returned by a camera aboard the Mars Global Surveyor spacecraft, which "revolutionized our understanding of Mars," says Candice Hansen-Koharcheck, deputy principal investigator for the orbiter's HiRISE camera. But when they created the technologies 20 years ago, the scientists expected they would be able to get even higher resolution in the future. Indeed, modern computing power and imaging technology will allow images from HiRISE to improve eightfold when, six months from now, the spacecraft moves into its final orbit between 225 and 320 kilometers from the planet. 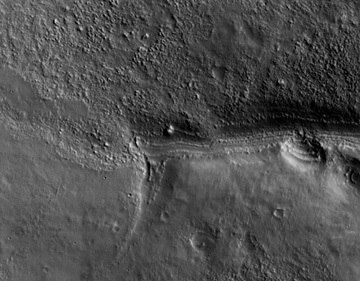 In close orbit, HiRISE images should have a resolution of about 30 centimeters per pixel, capturing everything from large boulders to the Mars Exploration Rovers, according to Hansen-Koharcheck. "What's nice about that," she says, is that images from orbit can provide a wide-angle view to pick out sites that look interesting or hazardous for future landing missions. Also of interest to astronomers will be to use HiRISE to look for features that indicate whether water could have existed at the surface. And an infrared spectrometer aboard the orbiter will look for signs of minerals that indicate hot springs or hydrothermal activity. Searching for water, however, is not the team's only focus. They also want to find out details such as how much and how long ago water flowed, as well as details about volcanism on the planet. The team will also look to the polar regions for records of changes in the martian climate. "There are lots and lots of things that we'll be able to do with this kind of resolution," Hansen-Koharcheck says. The team plans to gather one more set of test images tomorrow, but will then have to wait until the spacecraft reaches final orbit sometime in late September or early October before taking any more images. For now, Hansen-Koharcheck says that the team is "quite pleased" that the camera is stable and working well.